Book any activity with My Boracay Guide one week or more in advance And get a 100% absolutely FREE sunset cruise ticket with our Early Bird Special. If you book 4 activities, BANG! that’s 4 tickets -OR- If you book one activity for four people, BOOM! That’s 4 tickets too. It’s the best deal on the island, bar none. After you book your activity, you will be notified via email about the time and date of the cruise. Make your way to the pickup point, find our guide who is holding the boarding sign, and await departure. There are multiple Boracay sunset cruises every week so that you can get onboard one that fits your schedule. The cruise takes place aboard a 40 foot Banka boat, with lounge netting on the sides & surround sound stereo. 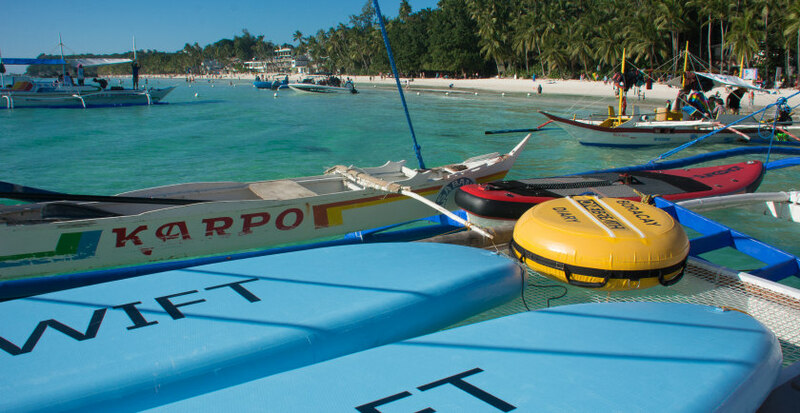 The boat will stop at a snorkelling point where guests can swim, relax, take photos and get ready for one of Boracay’s famous sunsets. Included on the boat are standup paddle boards, (seen above) floating tubes, & snorkelling gear you can use to view the several species of reef fish that congregate below. Water and soft drinks are included in the boats large built-in ice cooler for only 50 pesos each. Kick back, relax and enjoy a fantastic Boracay sunset cruise with friends, family and fellow travellers; make new friends & enjoy! Note, Each cruise can take a maximum of 30 passengers, so book early to guarantee prefered dates. Pickup & dropoff: Depends on weather, will be determined the week of the cruise. Going to: Reef areas sheltered from wind & waves. Food & Snacks: Not provided, can bring your own. Price: Drinks at 80 pesos everything else, free with your booking! Note: We also have a last minute promo. If you book any activity with My Boracay Guide 24 hours before the start of the activity you can also enjoy 20% off the purchase of a helmet diving activity. May I know the cancel policy? What if the weather condition not good could we change the date? If we have 4people join the stand up paddle, do we get the cruise for free? 5) Any cancellation of a booking must be through email and received by My Boracay Adventures at least 73 hours prior to the scheduled trip. * If a reservation is canceled 72 hours or less prior to the activity date, only 50% of the amount charged will be refunded. * If a reservation is canceled 24 hours or less prior to the activity date or the customer does not show up, the entire booking amount will be charged. 6) Tours or activities canceled by a tour/activity provider will be promptly rescheduled or a full refund will be made at the discretion of the guest. WEATHER CONDITIONS – While the service is in progress, cancellations due to weather conditions are solely at the discretion of My Boracay Adventures Management. A 100% refund will be made if the service is canceled due to severe weather conditions. You will be entitled of a free sunset cruise once you booked online and we will confirm the date for the cruise when we follow up for your pick up time of your reservation once you have arrived in Boracay. I am here with friends until Tuesday afternoon. If we book an activity today, is it still possible to get the free sunset cruise for Monday? May we ask what kind of activity you will avail and for how many pax this will be? We will confirm the date for the cruise when we follow up for your pick up time of your reservation. Hi, am i entitled for a free sunset cruise if i book parasailing for two pax in advance? Hello, Yes indeed you are entitled of the Boracay Free Sunset Cruise if you booked in advance online. We will confirm the date for the cruise when we follow up for your pick up time of your reservation once you have arrived in Boracay. Hi, may I know if your 2019 Super Special – Book any Activity & get FREE Boracay Sunset Cruise still available? Hello Jz, Yes indeed it is still available. Book any activity with us and you are entitled with Free Boracay Sunset Cruise except for banana boat and pubcrawl. Does it have to be a 24 hours in advance to get the discount for helmet diving? This promo will run until when…? If you’re going to book online in advance by one week or more, then you’re very much welcome to join us on the free sunset cruise. The sunset cruise starts at 4:00pm and usually ends between 6 & 6:30. The Pub crawl starts at 7:00 pm. The date of the cruise will be arranged prior to your arrival. Catching the pub crawl after a sunset cruise would be difficult in terms of time, but both possible & heroic. Hi, if I book banana boat ride more than 1 week advance for 2, we can enjoy free sunset cruise for 2? We will be in Boracay 17-20 March. Thanks. Hi there Looi Nai Tze, thanks for reaching out! Sure Jenny. We’ll be in touch shortly! This entry was posted on Wednesday, February 6th, 2019	at 5:43 pm	and is filed under Guides, Recent, Specials	. You can follow any responses to this entry through the RSS 2.0	feed. You can skip to the end and leave a response. Pinging is currently not allowed.